Universal Sportsbiz Pvt. Ltd (USPL) announced that WROGNTM - India’s leading celebrity breakaway youth fashion brand, and IMARATM - the women’s ethnic wear brand will be the “Official Lifestyle Partners” for team Royal Challengers Bangalore (RCB), the Bangalore based franchise of the Indian Premier League (IPL) for the 11th edition of the upcoming T20 bonanza. 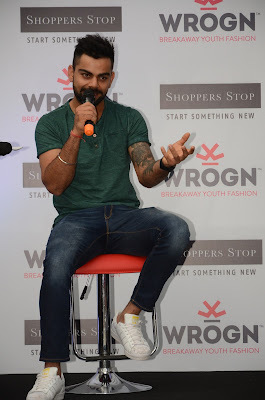 WROGN fashion will add the right style to the RCB team with the squad sporting WROGN’s trendy and quirky designs off the field, and sporting the WROGN logo on their caps and helmets when in action on the field. On the home ground, WROGN’s funky in-stadia branding will add colour and enhance the vibrant and lively atmosphere during the matches. IMARA, a contemporary interpretation of the conventional with a refreshing take on ethnic designs, will be the first women’s fashion brand to be an Official Lifestyle Partner for a team in the 11th edition of the T20 series. The two brands have comprehensive plans to engage and interact with RCB fans and customers at their outlets across the country. The association will be promoted across digital properties of RCB, WROGN and IMARA including the official websites and social media channels. Customer will also have the opportunity to get tickets to RCB matches on shopping either online or in stores. Last season, the T20 matches had achieved a 24 percent jump in television and digital viewership as compared to 9th edition. The average impressions per match stood at 21.18 million as against 17.11 million in 2016. This year, the player auction itself received a record viewership of 46.5 million on television that was six times more than that last year, and digital viewership five times more. This season, the T20 matches are expected to see record viewership of about 30 million average viewership per match.